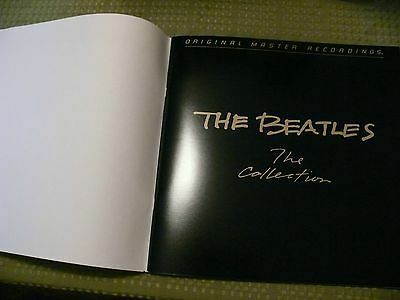 This “The Beatles The Collection” 14 LP box set by Mobile Fidelity Sound Lab (MFSL) is for sale from its original owner. This limited edition Beatles box set is complete and in overall mint condition. Box set has its booklet with original protective cover and the Geo disc which was never opened or used. Only LP #1 was played on one occasion on a high end B & O turntable so there are no scratches of any kind. The other LPs were never played; never opened. All LPs are in their original inner sleeves and the jackets are in perfect condition. The black box itself is very nice with the brass hinges tarnishing a bit but otherwise as issued with a small mark or two on the box itself (refer to photos for details). Original Certificate of Authenticity is included; certificate #21,726. Don't miss this one! This is an excellent box set and it will be a great addition to any audiophile’s collection! This The Rolling Stones 11 LP box set by Mobile Fidelity Sound Lab (MFSL) is for sale from its original owner. This limited edition Rolling Stones box set is complete in overall mint condition. Box set has its booklet and the Geo disc which was never opened or used. None of the LPs were ever played or even removed from their sleeves. All LPs are in their original inner sleeves and the jackets are in perfect condition. The box itself is very nice with the brass hinges still bright and shiny, otherwise as issued with a small mark or two on the box itself (see photos). Original Certificate of Authenticity is included; certificate #2606. The Bonus and promotions envelope that came with the set remains sealed and has never been opened.Don't miss this one! This is an excellent box set and it will be a great addition to any audiophile’s collection! These items come from a smoke-free home and are being sold as is.